North Carolina abortion law’s effect on one mother. A dangerous pregnancy, a mother of four, and the real-life impact of North Carolina’s abortion restrictions. 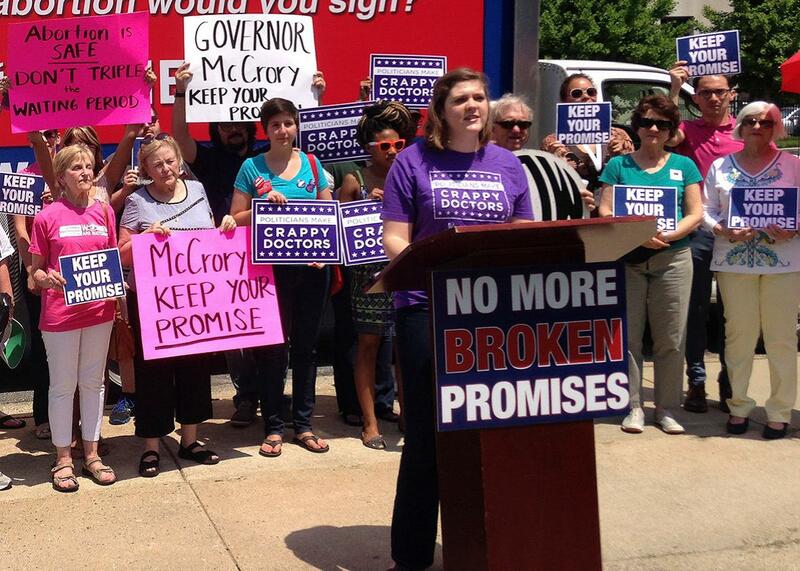 Hannah Osborne, a community organizer for NARAL Pro-Choice North Carolina, speaks at a rally in Greensboro on May 6, 2015, against the bill that extended the waiting period for abortions in the state to 72 hours. Sonia Loureiro never expected to need an abortion. A married, 34-year-old mother of four, Loureiro had relied for years on a copper intrauterine device, or IUD, a hormone-free method of birth control that allowed her to avoid some of the side effects of the pill. Busy working and caring for her kids—Loureiro works from her home in Raleigh, North Carolina, as a human resources coordinator—she wasn’t paying much attention in late 2015 when her state passed some of the most restrictive abortion laws in the country, and she had never thought much about where she stood in the abortion debate. But in January, Loureiro found out she was pregnant. “I’m one of those Google people,” she says, explaining how she discovered some of the risks and complications of her pregnancy through online searches. An IUD like the one that Loureiro used prevents pregnancy by affecting sperm’s ability to fertilize the egg and has a better than 99 percent success rate; it’s supposed to last between 5 and 10 years. The risk of miscarriage, premature delivery, and placental abruption would be greatly heightened by leaving the IUD in place. Soon after she discovered the pregnancy, at around six weeks’ gestation, she was experiencing a sharp pain in her left side and bleeding heavily. She saw an obstetrician, who asked her right away if she wanted an abortion; Loureiro was taken aback and said she didn’t know. The doctor confirmed that leaving the IUD in place was risky; surgically removing the device would end the pregnancy. Loureiro agreed to allow the doctor to attempt removing the IUD manually, using forceps, but the attempt failed. Loureiro made a follow-up appointment with the obstetrician, in case she decided to continue the pregnancy, but also asked for a referral to a clinic that could attempt to surgically remove the IUD and also provide an abortion. That night, she talked over the decision with her husband. They agreed the risks of miscarriage and preterm labor, plus the threat to her own health, were too great. They had four other children to think about, and Loureiro’s pain and bleeding were getting worse. Loureiro talked to her mother and girlfriends, who all said they would do the same thing: opt for surgical removal and an abortion, the safest option for Loureiro. I’m sometimes surprised by how little I have to wait for things. If I’m sick, I can usually arrange an appointment with my doctor for the same day; outside of office hours, I can call a 24-hour nurse line and have my call returned in 20 minutes or less. At the grocery store near my house, cashiers open new registers rather than let waiting customers get bored enough to pick up a magazine. If I had a permit—I don’t—I could buy a gun, or several guns, with no waiting period at all. The experience of not-waiting is thrown into relief by periods of waiting—I don’t think about the convenience or speed that attends my life’s big and small tasks until something stands in their way. Waiting then becomes more than an inconvenience; it feels like a punishment. In North Carolina, as in many other states around the country, waiting is just one of the obstacles women face when seeking abortions. Thirty-eight states require counseling before abortions, and 28 require a waiting period before the abortion can be performed. The wait is most often 24 hours, but six states—Louisiana, Missouri, North Carolina, Oklahoma, South Dakota, and Utah—require 72 hours. Because clinics often provide services only three or four days a week, and can be geographically out of easy reach for many women, it’s easy to see how waiting periods can be extended beyond what’s legally required. South Dakota even stipulates that weekends and holidays aren’t counted in those three days of waiting. In addition to the longer waiting period, North Carolina women and their doctors became subject to another new restriction: Whenever an abortion is performed after 16 weeks, the doctor must now submit what the law describes as an “ultrasound image of the unborn child” to the state’s Department of Health and Human Services. The law makes no mention of the woman’s uterus also pictured, and does not require doctors to inform patients that their health records will be collected and stored by the government. Other states, such as Texas, Ohio, and Mississippi, have shorter waiting periods but require patients to attend in-person consultations before the wait begins. If a patient discovers her pregnancy on a Monday, travels to the clinic for her consultation on a Friday, and the clinic doesn’t offer appointments until the following Thursday, she has waited far longer than the state-mandated time. Any additional delay caused by a weather event or other factors could mean the difference between an abortion performed locally and one that would require travel, additional expense, and higher risks. Some women might be forced to continue unwanted pregnancies. The impact of this waiting—on women’s health and their constitutional right of access to abortion—is at the heart of Whole Women’s Health v. Hellerstedt, the first major abortion case argued before the Supreme Court in nine years. The case asked the currently eight-member court to decide whether Texas has to prove that abortion restrictions designed to protect women’s health and safety must actually accomplish their stated goals. Restrictions in Texas’ HB2 law—which requires physicians to obtain admitting privileges at local hospitals and requires clinics to have the same resources as ambulatory surgical centers—will close more than three-fourths of the state’s remaining abortion clinics. Though the law’s stated intention is the protection of women’s health, it isn’t hard to see how the result will be the opposite. Texas’s clinics are already overburdened; in some facilities, patients wait an average of three weeks for an initial appointment, and researchers predict that the number of second-trimester abortions could nearly double if HB2 is fully enforced. For some women, especially poor women from rural parts of the state, shrinking the number of Texas’s available clinics from 40 to nine or 10 will make safe and legal abortions essentially unavailable. They waited seven hours before being seen. When Loureiro was finally called in to an examining bay, she described her situation and fears—that this was an unsustainable pregnancy, that her body, confused by the presence of both the IUD and the embryo, was trying to end the pregnancy on its own. The doctor wheeled in what looked to Loureiro like an “old, old ultrasound machine” and performed an exam, which was inconclusive. How many maxi pads was she using? the doctor asked. Could she sit up? Unless she was doubled over in pain or soaking two pads an hour, there was little the ER doctors could do for her. She’d have to wait to be seen at the clinic on Tuesday, they told her. Loureiro and her mother left, driving home on ice-covered roads. Aside from the births of her children, Loureiro had never been admitted to a hospital, and she is reluctant to complain or criticize the people who cared for her. The Ryan Clinic nurse had given Loureiro her personal cellphone number and stayed in touch before the clinic closed, she told me; everyone at the clinic was “exceptional.” Even the IUD had worked great, she says, until it didn’t. But the unexpected waiting period, followed by the long, fruitless emergency room visit, gave her a new perspective on the divide between doctors and patients, at least where abortion is concerned. I asked Dr. Matthew Zerden, an OB-GYN who provides care for Planned Parenthood South Atlantic, about Loureiro’s experience. While he couldn’t comment on the specifics of her treatment, he acknowledged that North Carolina’s laws have impacted the relationship between patients and their doctors. “Some physicians may be fearful of how they can practice or the implications of their care, and it may result in patients not receiving the care they deserve,” Zerden says. But delays in care—like the one Loureiro faced—appear to have the most obvious negative impact. The clinics where Zerden practices were also affected by winter storms this year, and he notes that the combined impact of unpredictable weather delays and the 72-hour waiting period directly affected the timing and type of care some patients received. Her question was sincere. She really wanted to know why the Women and Children’s Protection Act was passed, and what purpose its authors believed it might serve, if not to protect women with children—women like her—from unnecessary pain and suffering.